When it comes to online reputation, auto dealers are no different than any other business, be they hotels or plumbers -- or individuals for that matter: treat them right and your virtues are amplified online; give one person a crappy experience and the world will know. And with social media channels, that’s true now more than ever. Car and truck shoppers have been using the Web for years to get a fix on the vehicles they are considering, and to compare the short list. But now they are using online resources to select dealers, both on review/research sites and increasingly, on social media. The percentage of consumers now doing their automotive shopping using the Web has reached 80 and among them one-third use ratings/review sites like Edmunds.com, KKB or TrueCar when selecting a dealer, per the new J.D. Power and Associates 2012 U.S. Sales Satisfaction Index (SSI) Study. The study, from surveys of 31,386 buyers who purchased or leased their new vehicle in May, also shows that although new-vehicle buyers still favor ratings/review sites rather than social networks to select a dealer, satisfaction with the dealership experience is significantly higher among new-vehicle buyers who use the latter. The study shows that males favor ratings/review sites, while females are significantly more likely to consult social networking sites. Both genders are equally likely to visit blogs, forums, or social networking sites (7% each); however, females post considerably more positive online statements regarding their dealer experience compared with males. Eighty-six percent of comments by the later are “mostly positive” vs. 77% of comments by men. Among luxury brands, Lexus ranks highest for a second consecutive year. Next are Infiniti and Cadillac. The biggest improvements are for Infiniti, which moved the brand from eighth last year. 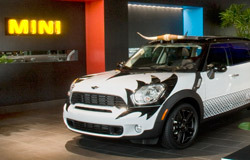 Among mass-market brands Mini ranks highest for a third consecutive year, followed by Buick and GMC. Honda improved the most among mass-market brands moving from 12th in 2011 to eighth this year.